This product is non-selective and will kill or injure all vegetation contacted by the spray. Absorbs through the leaf and stem only so killing power won’t spread to non-target plants through soil. Kills weeds growing in lawns without harming lawn grass. Rapid and effective control of common and troublesome broadleaf weeds such as dandelion, plantain, chickweed, clover, ground ivy, wild geranium, wild strawberry and more. Good for cleaning up walkways, driveways and flower beds. One gallon covers 32,000 sq. ft.
Non-selective. Will kill or injure most vegetation contacted by the spray. Also controls noxious perennial weeds on non-crop land, lawns and other ornamental turf grass areas. Controls poison ivy, poison oak and wild blackberry. 5 in 1: Kills broadleaf weeds, disease, moss, algae, plus greens up lawns. Works fast (hours), in low temps. Re-seed in only 1 day, and can apply to new grass after only 1 week! Effective on over 200 hard to kill weeds, right to the roots. Visible results in just 24 hours, rainfast once dry. Re-seed in just 2 weeks! Superior cool weather performance down to 45°F extends application window. Contains “See Spray” non-staining blue marker dye. Incredibly effective pre and post emergent control of goosegrass, nutgrass (and all sedges), crabgrass, foxtail and many, many other problem grassy type weeds. One pint treats 2000 to 8700 square feet. Kills lawn moss quickly. Works in hours! For best results, apply this product when lawn is moist. Mow lawn to expose existing moss prior to application. This allows the granules to fall through the grass to the soil and go to work. Water in to hasten the moss killing action and greening process. 20 pound bag covers up to 5,000 sq. ft.
IRON WILL STAIN. Use this product on lawns only. Kills vines, stumps and brush. Formulated for complete and permanent control. Comes with convenient applicator cap. Preen Weed Preventer stops weeds from germinating in flower and vegetable gardens, in ground covers and around trees and shrubs. Although Preen will not kill existing weeds, it will prevent new weeds from sprouting – eliminating the need for difficult and time-consuming hand-weeding. How to Apply – When plants are dry, sprinkle this product on soil surface at rate given below for your specific planting situation. Once activated by watering, it forms a weed control barrier in the top layer of soil (1-2 inches), preventing weed seeds from germinating. Disturbance to the soil surface after activation may result in erratic weed control. Preen® Extended Control™ Weed Preventer is the longest lasting Preen® yet, stopping weeds for up to six months per application. For use around 600 plants in perennial flower beds; around groundcovers, trees and shrubs. 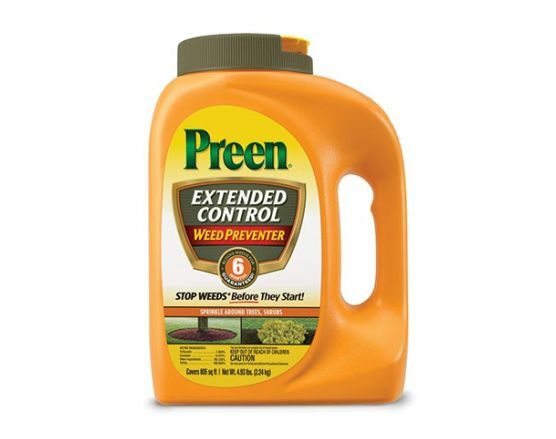 Preen® Extended Control™ Weed Preventer tackles many of the toughest weeds a gardener faces, including: dandelions, crabgrass, field bindweed, white clover, chickweed, henbit, purslane, Carolina geranium, stinging nettle, horseweed or marestail, oxalis, spurge, lambsquarters and more. How to Apply –First remove any existing weeds that may be growing. Then apply Preen® Extended Control Weed Preventer using the easy-to-use bottle with flip-top applicator-cap. Sprinkle the product granules on top of the soil or mulch at the rate recommended on the label. Once the product is activated by watering, it forms an invisible weed control barrier in the top layer of soil (1 – 3 inches), preventing new weeds from growing. If it’s not possible to water in the product right away, and no rain falls within two days, use a rake to work the product into the soil or mulch. Super-charge your lawn & garden chemicals with spreader sticker! Designed to provide better distribution and adhesion of all types of insecticides, herbicides and fungicides. Helps your chemicals stick to the leaf of the plant and spread out evenly on the leaf surface. I’d like to kill the weeds in my lawn without harming my grass, is there anything I can use? There are a few products to use on a lawn to kill broadleaf weeds. In spring, use Speed Zone and in the summer months, use Bonide’s Weed Beater Lawn Weed Killer. Poison ivy is best killed with Bonide’s Poison Ivy & Brush Killer plus the addition of a spreader sticker.